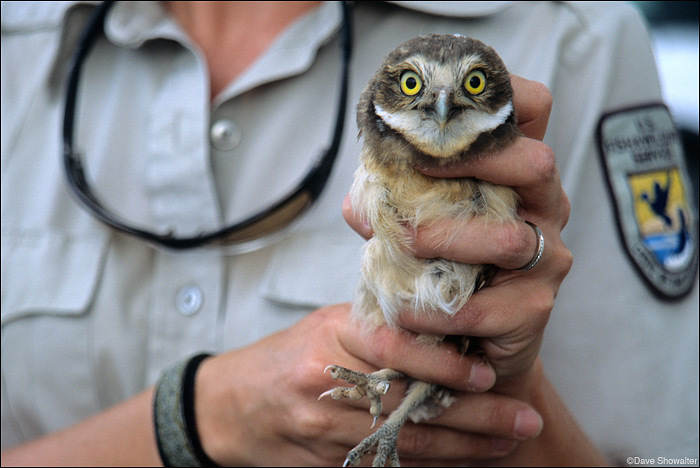 A staff biologist shows proper handling of a newly-banded burrowing owl chick. The birds were trapped and banded, measured, weighed, and had blood drawn for West Nile Disease testing. It was discovered that although they were carrying West Nile, the RMA burrowing owls had developed immunity to the disease. Western burrowing owls are a threated species in Colorado. Athene cunicularia . Photo © copyright by Dave Showalter.